I am so happy with my progress. I kept at her face, or I should say the order in which I picked which symbol to stitch next meant I could work on her face for a bit! I am really happy with how she is turning out! Its amazing what a few stitches to her mouth can totally change her expression! ﻿I am really looking forward to the rest of her face filling out! This is what makes stitching so enjoyable, just seeing all those individual stitches come together and make this beautiful face come alive! @ krystaline, sorry you cant see it. Maybe it will come back up a little later for you. I understand! It is a beautiful face and when you see appear them it is very nice to stitch on this work! She has a sweet smile now, Vani! WoW!!! I love her smile, gorgeous! She's looking beautiful Vani! Keep it up and she'll be finished soon! 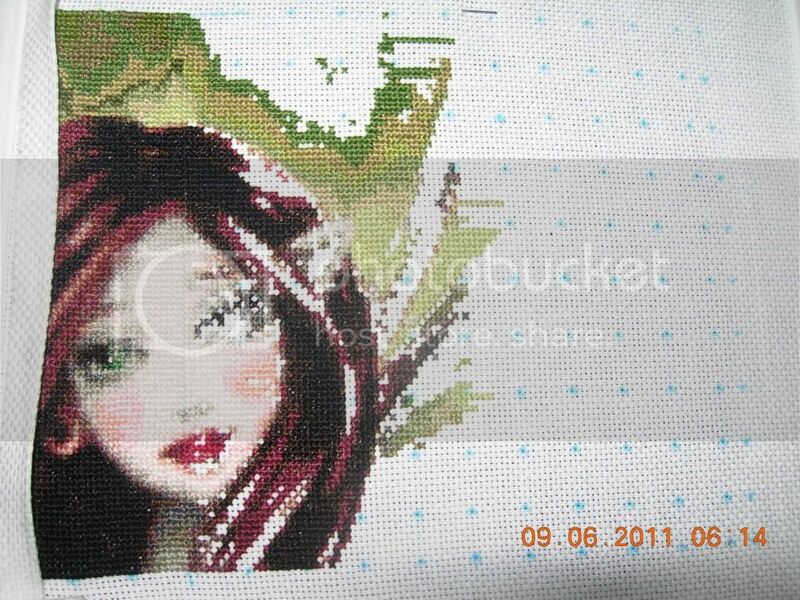 What a beauty, i really love all your stitch projects.Fairy's are one of my favourite designs. I'm going to follow you..